Marc Rothschild comes to RCSC with over 20 years experience in the health club business. From developing new clubs to acquiring existing ones, Marc has held roles from membership consultant to VP of operations for a multi-million dollar club company. Having built and opened RCSC in 2000, Marc is excited to return to the club and help continue its growth and success within the community. Sharon writes: Born in Baltimore, I grew up as a quintessential army brat, moving annually and then settling in Florida after high school. I graduated from Florida State University with a Computer Science degree and spent 10 years as a software engineer, but embraced bodybuilding for my alter-ego. I took a few years off from work to be home with kids, and when it was time to get back into the workforce I followed my passion and became certified as a personal trainer. I was fortunate to be hired by Rock Creek Sports Club during the construction phase and have enjoyed many years and many roles here. Currently the Fitness and Operations Manager, I have the privilege of working with an incredibly talented and professional staff of trainers as well as maintaining an exceptional fitness facility. Gwen Bailey, the Membership Accounts Manager, has been part of the RCSC team since 2007, when she retired from the corporate and consulting world. She worked as an IT project manager for Verizon for 22 years, and as a consultant to many companies and the federal government for 9 years. 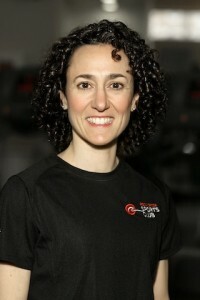 Marian Lally ia the Pilates and Programming Director at Rock Creek Sports Club. She holds her Pilates Comprehensive Certification through Balanced Body, and is certified by the Pilates Method Alliance (PMA). She brought Pilates to Rock Creek Sports Club starting with one Reformer in the corner of the club, and grew the program to include a small private studio downstairs including two Reformers, Towers, a Chair and Barrels. Pilates has become an important part of the mindful, rehabilitative and corrective exercise offered at RCSC. Marian has also grown the kids’ programming at the Club, and continues to work on ways to bring fitness to all young ages. Marian’s management style is is that of a ‘straight shooter’ who remains diplomatic and open to new ideas. As the former Group Exercise Director where she grew the program to include more than 65 classes a week, she now supervises the current Group Ex Director to help maintain the quality and variety of classes and instructors. Marian has been in the fitness industry since 1992, and was an ‘inaugural’ group exercise instructor at Rock Creek Sports Club since it opened in 2000. In addition to Group Exercise Certification through the American Council on Exercise, Marian is also a certified Personal Trainer through ACE, and works with new personal trainers hired by the club. She graduated from the University of Maryland with a B.S. in Journalism. Originally from Grand Rapids, Michigan, Samantha has been a certified personal trainer since 2012. She is also a certified group fitness instructor and has taught many styles of classes ranging from water aerobics to group strength training. Her favorite classes to teach are Cardio Kickboxing and Bendable Body, and her favorite classes to take are Zumba and HIIT classes. As our Group Fitness Director, Samantha is responsible for updating and improving the class schedule at the club. She takes into account member needs and instructor availability to ensure that Rock Creek Sports Club has the best possible group fitness schedule. Samantha also plays a role in creating the special holiday class schedules and any group fitness related fundraisers hosted at the club. Any questions or concerns regarding the class schedule can be directed to her, and the best way to show your love for a class is to keep attending and bring a friend!